Pro version of Active@ Disk Image supports creation of an incremental backup as a scheduled task. When you create a new task the first wizard dialog you see is selecting a backup type. 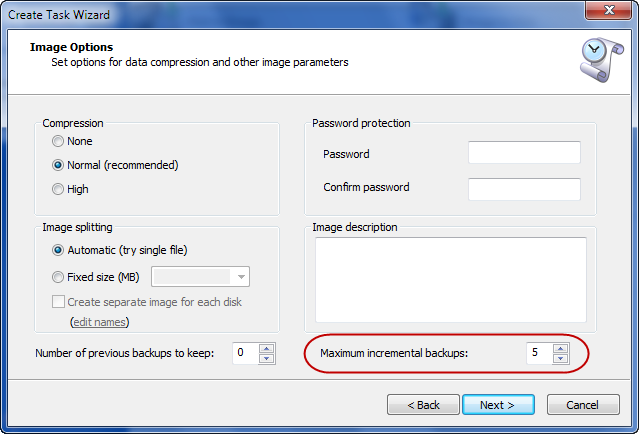 To create an incremental backup, select Incremental backup. 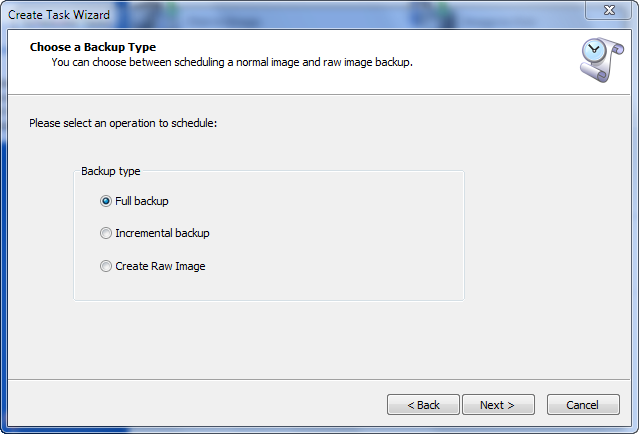 The logic behind creating a scheduled incremental backup is slightly different from the one for manual backup. Here you won't be prompted for choosing a base image. The following schema is used in creating/naming incremental backups. The first created backup will be a full backup. Next, up to specified maximum incremental backups will be created. Then, again a full backup and a series of incremental backups will follow. The limitation of number of incremental backups in a series is necessary to cap the dependency on previous backups, i.e. if the backup you need to restore is a 3rd incremental backup, you will need all three incremental backups and a full backup to get the data. The longer the chain of incremental backups, the greater the number of files to worry about and potential risk of corruption. Therefore it is best to keep it reasonably short, say under 10 backups. Keep in mind, that "Number of previous backups to keep" counts only full backups, not incremental when deleting old backups.